The history of the Catholic faith in this area can be traced back over 300 years. Just below Woodstock, in the 1600’s there was a community of Maliseet Indians at what is known as Medoctec (Meductic). Various French Missionaries: Jesuits, Franciscans and Recollects journeyed up the Saint John River to bring Christianity to this part of the new world. By 1717 a tiny chapel dedicated to St. John the Baptist (St. Jean-Baptiste) was built. In 1784 the Province of New Brunswick was formed. In 1785 Woodstock began as a settlement by the Loyalists. 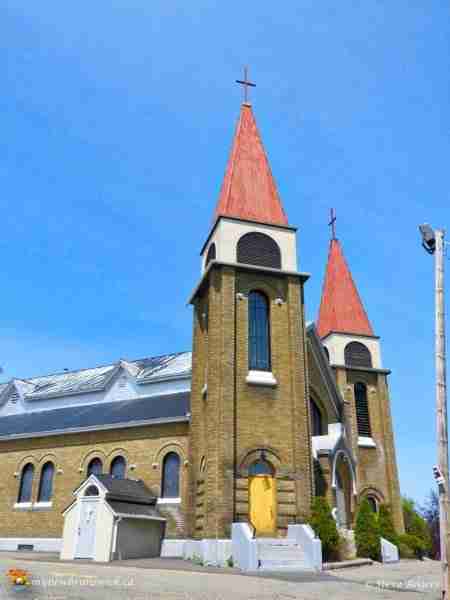 By the early 1800’s, the arrival of Irish Immigrants signalled the need to build another church closer to the growing Catholic population in Woodstock, known in those times as “The Creek”. From 1810-1830 Catholics gathered occasionally in homes to celebrate the Eucharist. In 1832, under Father William Dollard, St. Malachy’s Chapel was built on the present site of St. Gertrude’s. On October 8, 1842, St. Gertrude’s Parish was incorporated – the first resident priest being Rev. Richard Veriker. At the same time in 1842, the Diocese of Saint John was created and also that same year saw the establishment of the Maine-N.B. Border as we know it today. In 1849, the Parish of Woodstock encompassed the area from Nackawic to Grand Falls, on both sides of the river, and included Houlton, Maine, as well. Father Veriker began working on plans for the construction of a larger church to serve the growing population. However, it was a decade before the first mass could be celebrated because of a period sectarian strife between the Protestants and the Catholics in the area. The most dramatic being a riot which occurred on July 12, 1847 between the Orangemen and local Irish Catholics in Woodstock. It was not until the coming of Father Thomas Connolly, a pioneer priest in New Brunswick, from Chatham, in 1849 that the second church was completed. Father Connolly was appointed to Woodstock for three different terms spanning four decades and may be considered to be the most prominent priest in our history.